I'm looking through my papers and stamps to see what I can put together to quickly make a birthday card. Don't you hate it when you need a quick card? 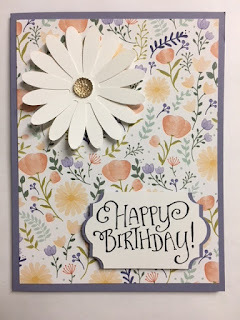 I LOVE Decorative Series Paper (DSP) because it can take up a lot of real estate on a card and leave you with little more to do! Here I used the "Delightful Daisy" DSP, I cut it 4" x 5-1/4" and taped it in place. Next I took the Daisy punch and punched out two flowers and stuck them together with a glue dot. I set the daisy in place using a Dimensional. I added a gold faceted gem to the center. I love the daisy punch and DSP. Beautiful card. 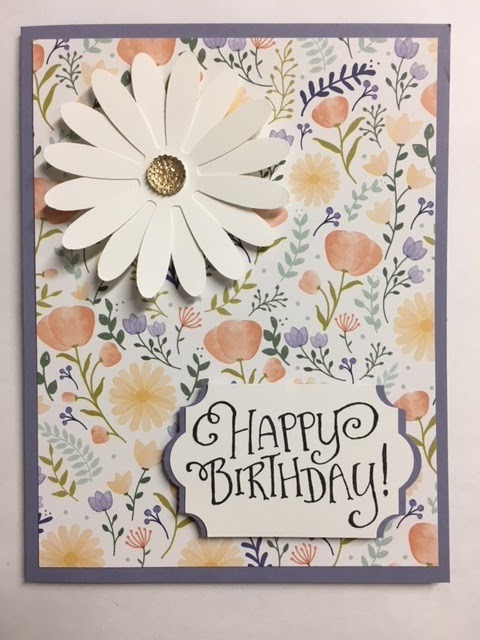 Thanks for the inspiration of making cards I need for February birthdays. You gave me the push I need. Have a great day!